Synopsis: Sequel to The Viscous Deep. In the quest for the Sea Throne, Tristan has already watched one good friend die. Now he must lead the rest on a dangerous voyage to the infamous port of Tortuga Cove in search of the trident that will make him king. But while Tristan chases his destiny, the dark forces raging against him are getting stronger and the sea witch of his nightmares is getting closer. Battling pirates, sea dragons and mutant creatures of the deep, Tristan needs his friends' support. But they each have their secrets, and a betrayal will force Tristan to choose between loyalty and ambition, friendship and love. 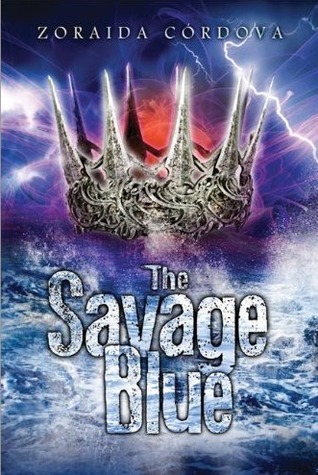 In the race for a throne, all's fair in the savage blue. My Thoughts: I just recently read The Viscous Deep and I loved it (Review to come). I cannot wait for the sequel to come out, Tristan's story is probably the best mermaid/merman story that I have read in a while. I am totally obsessed with mermaids/mermen right now. I mean there have been some great ones coming out *cough* Of Poseidon, The Viscous Deep *cough*. The next mermaid book that I have on my list is Tempest Rising by Tracy Deebs! Can't wait!